The anathema pauses on the temple steps. Its tongues dart out, smelling the fresh air, inadvertently catching the falling snowflakes. It squints its eyes in sunlight it hasn’t seen in several centuries. Then it raises its heads and hisses a hateful challenge to the sky itself. What’s this poison card business, you ask? At first I considered handling anathema’s poisons like beholder eye rays. But that would require a lot of extra rolling, not to mention having to read out the effects of the poison time after time, players forgetting details, etc. Poison deck avoided those issues. I’ve printed 4 copies of that page, cut them up and inserted in MtG card sleeves. It worked so well that I’ll probably use cards for any complicated effect from now on. Since the fight was happening outside the temple, where the PCs have retreated to avoid fighting the monstrosity in the confined space of the temple, there were going to be waves of yaun-ti minions rushing to protect their sacred terror. On the plus side, the party has a sentient flying ship called Discovery armed with lightning cannons. Following are the notes for the rest of the encounter, tactics, etc. That player rolls d6 to determine the side they enter from, and d3 to determine the number of fanatics. Hit: 2d8 + 14 lightning damage. A creature of your choice other than the target and within 10 squares of the target takes 8 lighting damage. You can add +12 damage to either the original or secondary target. Violent tremors shake the anathema’s body. It spasms in horrid pain as its multiple heads pull in different directions. Then, with a wet tearing noise, they succeed. The anathema explodes. Thousands of snakes fly outward, covering streets and rooftops. Even as they do, stones rise and twist to meet them in a thousand serpentine motions. Everything slithers, hisses, writhes, wraps around your legs and crawls up your spine. A single gigantic snake rears its head and fixes its hateful eyes on you. This is not right. There must be some magic at work here. None of this is real. Insight or Nature DC27: you see the lies, and they will not hold you. You may ignore the difficult terrain feature of the hazard. Let your inner snake out. Stick out your tongue and hiss: “Me and you are of the same blood” Diplomacy, Bluff or Arcana DC37: gain poison resist 20 for as long as the snake kingdom lasts. Every square becomes difficult terrain. Whenever a character ends their turn in the snake kingdom, they get attacked. New yuan-ti fanatics don’t arrive for the duration, but neither do Discovery’s cannons fire – the crew have their own snakes to deal with. +28 vs AC, 3d12+11 poison damage and draw a Poison card. DC27 Acrobatics check as part of a move action to ignore the difficult terrain. Failure causes the hazard to make an opportunity attack. DC27 Endurance check as a move action to move very slowly and prevent the attack this round. Anathema doesn’t care about other yuan-ti. Its snap bite will target them just as happily (but only 1 free attack/turn!). Also, see Religious Fervour. During the Snake Kingdom, anathema uses the lock-down the terrain provides and its teleport at the start to go after the squishy enemies. Anathema has poisonsight – it can see anyone who is suffering from a poison effect. The party has too much blindness. Quite well. As mentioned, the poison deck worked perfectly. 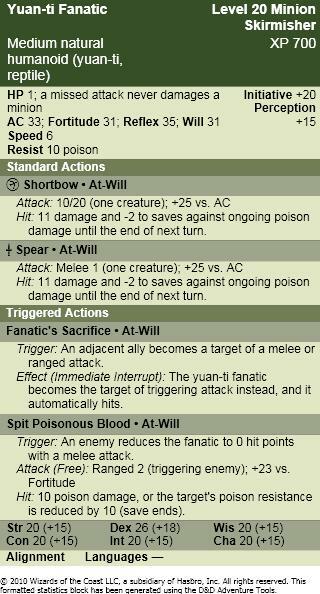 The combat itself was somewhat skewered due to the party rolling 7 crits in the space of 5 rounds it took them to defeat the anathema, 2 of which belonged to the assassin, dealing 200 and 160 damage (the latter included him teleporting a grand total of 20 squares into the air and performing a drop-charge where the falling damage he sustains was also dealt to the target). Unfortunately, that ended the Snake Kingdom in a round. Other than that, worldbreaker went off without a hitch – the transformation and opening skill checks didn’t ruin anyone’s immersion as I was slightly afraid they could have. This combat confirmed what I suspected before – worldbreaker shouldn’t recharge every quarter of monster hitpoints, as some of the earlier versions did – it’s entirely possible for a party to deal that much damage in a round.